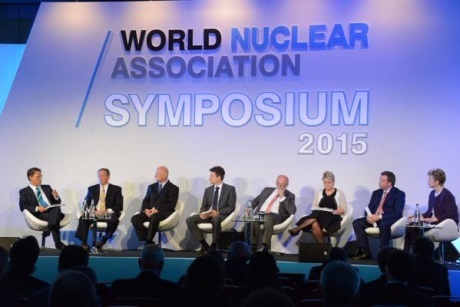 Industry leaders last week debated how to bridge the gap between the World Nuclear Association's vision of an extra 1000 GWe of new nuclear power capacity by 2050, and the practicalities of working within current political, regulatory and financial environments. Ann MacLachlan, a long-standing nuclear energy journalist who moderated the High-Level Panel at the association's 2015 Symposium in London on 11 September, asked how the ambitious target could be met. First and foremost, nuclear power needs to be acknowledged for the important role it plays in providing reliable and low-carbon electricity, said Michael Pacilio, executive vice president and COO of Exelon Generation. Exelon operates 23 of the USA's 99 nuclear power reactors. Of those, 22 are in unregulated, merchant plant markets. "There are two ways we make money in the merchant market in the United States. One is by selling energy and energy prices currently are very, very low because, thanks to fracking, we have more natural gas now in the United States than shelled corn. And we see energy prices for the long haul staying relatively low," Pacilio said. "The other way is through the capacity market where you are paid a stipend per megawatt hour, essentially to be there when the transmission system operator (TSO) needs you to be there. And the penalties for that, if you're not there, are very high." Pacilio referred to the North American cold wave of the 2013-2014 winter that was caused by southward shifts of the North Polar Vortex. Natural gas distribution systems could not keep up with electricity demand during this period and coal piles froze, causing coal-fired power plants to trip offline. On the other hand, the country's nuclear power units maintained a capacity factor of more than 95%. "The TSOs, at least one and others are following, are now giving credit to this reliability that nuclear power brings," Pacilio said. This recognition led to a change in the regulation of the capacity market, producing a significant increase in the capacity payment to nuclear units, he said, "So we are seeing a shift in the appreciation of the nuclear power fleet." Valuing the positive environmental aspects of nuclear power will be the "next phase". Exelon Corp said on 10 September that it was deferring a decision on whether to retire its Quad Cities and Byron plants by at least a year. Both plants cleared regional grid operator PJM's capacity auctions this summer despite concerns about their profitability. As a result, Exelon is committed to operate Quad Cities at least until May 2018 and Byron until May 2019. Byron cleared the 2018-2019 capacity auction, and Quad Cities cleared the 2017-2018 transition capacity auction. The latest round of PJM auctions were the first to be held under new rules approved by the Federal Energy Regulatory Commission to reflect the changing nature of the generation fleet as more intermittent renewable and gas-fired generation comes on line. Referring to this "short-term reprieve" for Exelon's nuclear assets, Pacilio said the company is "optimistic enough not to make any announcements and to continue to work with the legislators, specifically on a low-carbon standard, which gives credit to nuclear power for being a low-carbon emitter." He added: "We're optimistic we'll get something through that. It won't be this year. It'll be next year." Jaejoo Ha, head of nuclear development at the OECD's Nuclear Energy Agency, said the nature of deregulated markets can put off potential investors in nuclear power projects. The high upfront costs of nuclear - and also of renewable energy - projects run counter to the way deregulated, or so-called liberalised, markets work, he said. That puts them at a disadvantage to gas-fired turbines that can be built within a year and require much lower investment initially. In a liberalised market, he said, there is "uncertainty of price", so that when it declines, a gas-fired plant operator "just exits the market". But renewables and nuclear project owners will have already spent about 80% of their investment even before their generating unit is brought on line. There is the risk that when nuclear units are commissioned electricity prices are low, meaning that decarbonisation can be a casualty of the deregulated market, he said. "One of our recent studies shows that Europe is a critical case in terms of the liberalised market. It shows that the wholesale electricity market has been more than one-third lower than it was in 2007," Ha said. "And if you have a 30% price decline, you lose $1 million." He added: "A liberalised market and decarbonisation cannot marry together." On the other hand, the leader of new nuclear build projects - China - has a regulated electricity market, he said. Some other projects elsewhere seek to avoid the problem of low electricity prices at the time when a nuclear power project is completed, by setting the electricity price even before construction starts. An example of this is Russia's project to build the Akkuyu nuclear power plant in Turkey, he said. Attila Aszódi, commissioner for the Paks II project at the Hungarian Prime Minister's Office, said Europe's liberalised market "is not the issue", but rather the amount of subsidies on renewable power generation in that region. "Liberalisation is not the problem; the problem is that the subsidies dedicated to renewables distort that market. In Germany, they have yearly €20 billion in subsidies and the whole amount of the electricity sold is the same amount of money," Aszódi said. Ha said some would argue the contract-for-difference (CfD) and strike price secured by EDF from the UK government for its Hinkley Point C project, is a form of subsidy. Pacilio stressed: "We're not asking for subsidies in the United States. We don't like a regulator to pick winners and losers. We want it to pick outcomes and that's why we want a low-carbon standard where nuclear can be on a level playing field with wind, solar, etc. - we are, by the way, the tenth largest wind company in the US." Asked about the support the Paks II project will receive from a Russian state loan - for 80% of the project costs - Aszódi said the "quite low-rate" credit facility will "help us push down the capital costs in the long run". He added: "We assume from that financial model that about €50-55/MWh will be the cost of the electricity if we levelize that for the whole lifetime of the plant." The Paks II project has cleared two of four hurdles at the European Commission level, he said. First, the European Atomic Energy Community (Euratom) approved a contract between Hungary and Russia on nuclear fuel supply for the plant in April. Second, the European Commission this month confirmed the project meets the requirements of Article 41 of the Euratom Treaty. The two remaining issues are whether the Russian and Hungarian government funding of the project constitutes illegal state aid, and the procurement terms. Aszódi said: "We are in daily contact with the Commission and we hope to finish those processes in the near future." He stressed that the financing models for Paks II and for Hinkley Point C are different. "We are not following the CfD. We believe the cost of electricity will be so low from our plant that it will be ‘in the market'. So, there's no long-term contract for the electricity, no subsidy, and we have quite a lot of analysis that shows the electricity price will be on a level at which the plant will be economical to run." Finnish Fennovoima has similarly forecast the price of electricity from its planned Hanhikivi I nuclear power unit. The company's project director, Minna Forsström, told the conference this will be thanks to the ‘mankala', meaning Finland's cooperative business model. Pekka Ottavainen, former chairman of Voimaosakeyhtiö, the cooperative of Finnish companies that owns Fennovoima, previously said the plant will deliver electricity at "no more than" €50/MWh. Fennovoima will thus be supplying its shareholders with electricity at a substantially lower price than the £92.50/MWh strike price that EDF and the UK government agreed in October 2013 for the Hinkley project. The government will top up EDF's income to this level if wholesale prices are lower; EDF will have to pay back to government if market prices are higher. Forsström said that the mankala model applies to 40% of the electricity produced in Finland. Created in 2007 as one such not-for-profit company, Fennovoima will thus be able to rely on a model that has been "well tested since the 1960s". Having utilities, manufacturing companies and municipalities as its owners, Fennovoima can reduce the financial risks associated with some nuclear power plant projects, she said. But the owners of the beleaguered Olkiluoto project are also based on the mankala model. The Areva-Siemens consortium began construction of the unit in 2005 under a turn-key contract signed with Finnish utility Teollisuuden Voima Oyj in late 2003. Completion of the 1600 MWe reactor was originally scheduled for 2009, but the project has suffered various delays and setbacks. The two sides have been embroiled in arbitration proceedings through the International Chamber of Commerce since December 2008. Asked how the mankala model can be described as successful, when Olkiluoto 3 has been beset with cost and budget overruns - Forsström said: "Our Finnish shareholders are looking for a partner that owns part of the [Hanhikivi] nuclear power plant because we believe that owner security creates much more motivation to finish the project on time and to budget. It's not about the money, or the equity, it's about the owners' responsibility." One of the Hanhikivi project owners is Russia's Rosatom, via the Finnish subsidiary RAOS Voima Oy it set up in 2013 specifically to hold a stake - 34% - in Fennovoima. Rosatom is expected to supply a 1200 MWe Gidropress-designed AES-2006 VVER for the project. Rosatom has nuclear power construction projects in 11 countries and Kirill Komarov, the state-run corporation's first deputy director for international business, stressed that not all of them are funded by the Russian state. "We have a lot of clients, like China, for example, which is paying for our reactors without any financial support from Russia. It's the same story in Iran, where the cancellation of international sanctions has created more opportunity for productive cooperation between us. In India, there is only partly Russian financing for the construction of the Kudankulam plant. The main part of the financing there is on the side of the India government and Indian companies," he said. Only the Paks II project in Hungary is using an intergovernmental loan with Russia, he added. "In Fennovoima, yes, we are one of the shareholders, but that doesn't mean we are financing 100% of the plant. We are financing the project according to our shares in the company as any other shareholder does," he said. Jay Wileman, COO of GE Hitachi Nuclear Energy, said decisions on financing new nuclear projects largely depend on whether the customer is in a developed market or in an emerging one. Between 2020 and 2025 by far the largest proportion of projects will be in nuclear newcomer countries, he said, adding that they have "unique needs". "Some are resource rich and some will need a consortia to bring financing, plus the technology, plus the build," Wileman said. "That doesn't have to be vendor financing. Each of the vendors will have already spent hundreds of millions of dollars in developing their technology, so we've got skin in the game, so to speak. A consortia that can bring each of these elements is really the true need, not just simply vendor financing." Komarov said the World Nuclear Association's 1000 GWe target is an interesting figure "because, even at the peak of this construction phase, we'll just be coming back to the level of the 1980s". It is important to note, he said, the difference nowadays in the rate at which new units are brought on line. "In the Soviet period we had peaks when we commissioned seven units in one year. On average it was more than five. Now it's a major task to have four." This raises the importance of Rosatom's approach to new nuclear projects - namely, serial construction. "This doesn't mean making nuclear power plants based on the same design and in the same country," he said. "For example, Paks II will be already the tenth and eleventh unit of the same design built in Russia, Belarus and Finland. If you meet the requirements of all the national regulators and adapt your design accordingly, the general idea remains the same. And if you repeat the design, you come to know it very well, and if something goes wrong, for example, with a reactor vessel, you can take the reactor vessel for another project and install that instead. This means we don't have a problem in meeting our obligations to customers or increasing the number of our orders." Asked about the challenge of first-of-a-kind projects, Wileman said that in 1996 his company brought on line the world's first ABWR (Advanced Boiling Water Reactor) - at Kashiwazaki-Kariwa in Japan - in 39.5 months. "We brought the second on line in just over 40 months, the third in 2005 and the fourth in 2006. So we have demonstrated that it can be done," he said. "It's incumbent upon us to get that credibility back for our industry. It needs to be able to demonstrate that when we add these 1000 GWe we have to do it reliably and predictably so we can meet the investor needs." Regulatory risk is clearly one of the factors that drives engineering and design risk, Wileman said. The Cordel (Cooperation in Reactor Design, Evaluation and Licensing) working group at the World Nuclear Association is "doing a great job" along with MDEP (Multinational Design Evaluation Program) groups, he said, of harmonising different regulations. "There's an obligation among regulators to create the right environment for us to be successful from country to country across our technology program," he said. Mike Weightman, former head of the UK's Office for Nuclear Regulation (ONR), said: "If you're confident in your design and in your capability to deliver it, then you should get no issues from the regulator. It's about addressing the issues that you should address. You own the design, you understand how you made it safe. What the regulator has to do is to challenge you, asking well, how is it safe?" He added that regulators have to adapt to changes in the industry. "At ONR, we developed a way of looking at things earlier rather than later, which made regulation more efficient. The earlier I can get into a design, the more effective I can be and that also reduces project risk and gives confidence to investors that you've got through that hurdle. The question is, is regulation a burden or is it an enabler?" Delays to the UK's nuclear power projects have been connected with finance and not with regulation, he stressed. The ONR became a statutory body in April 2014. The major nuclear power plant accidents that have occurred in the history of nuclear power have been "more to do with institutional failures rather than technical failures", he said. In May 2011 Weightman led the International Atomic Energy Agency's fact-finding team to Japan, following the Fukushima-Daiichi disaster. Weightman, who is now an independent nuclear adviser, said he is doing research with Cambridge University students into how to apply safety assessment methodology in order to assess "institutional robustness". "Post-Fukushima, it's about how we look on a global scale at institutional robustness in all the different guises it may be, rather than just at tying up the technical issues."